As Americans get pickier about their beans, small roasters and shops are filling their cups. 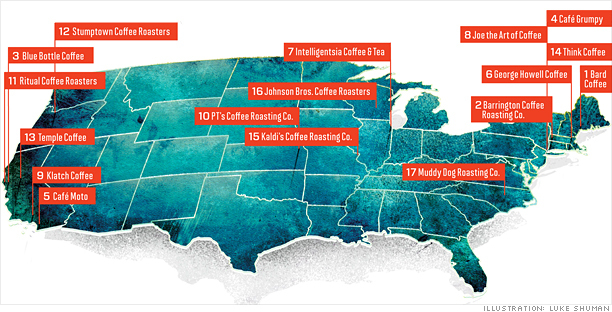 Cult coffee brands are popping up all over the country. From single-origin batches to the microlots by which they are artfully, even obsessively, roasted, they pride themselves on their craftsmanship and small size. (Forget Starbucks: Even Blue Bottle strikes some of these outfits as too "corporate.") With the help of Ken Davids, editor of Coffee Review, Fortune has mapped some of the industry's most promising players. Dunkin' brands has gone public again. Some highlights from its complex and tasty history.